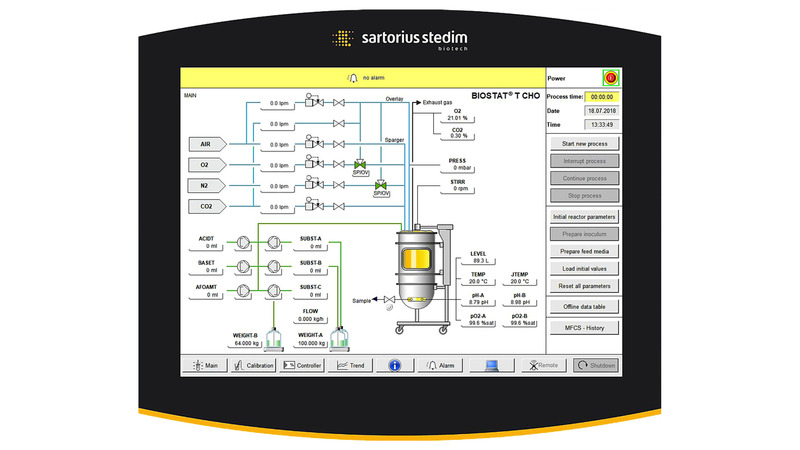 The BIOSTAT® T CHO is an interactive software training tool and ideally suited to educate students and operators in bioprocess control. It enables users to learn about bioprocess engineering and to practice with menu navigation and control of a bioreactor prior to operating an actual bioreactor. Apply recently acquired theoretical knowledge immediately as no hardware except a computer is needed to use the BIOSTAT® T CHO. Learn the principles of bioprocess control and bioreactor menu navigation virtually and gain the capability to achieve high quality results when using a bioreactor in real life from the very beginning. Perform trainings virtually to mitigate the risk of human error and prevent batch losses when running a real cultivation process. Minimize the amount of laboratory clean-ups and procurements of bioreactor media in addition, to save time and money. The BIOSTAT® T CHO mimics the human-machine interface and functionalities of a BIOSTAT STR® 200 L single-use bioreactor. It is based on actual Chinese hamster ovary cell batch data and enables users to gain insights into the characteristics of a CHO cultivation. Users have to utilize the broad variety of software features to determine the optimal parameters for cell growth and antibody yield. Choose process parameters, time ranges and data view individually to analyze the cultivation progress in your desired way. Calibrate probes, pumps and totalizers of your virtual bioreactor. Evaluate your cultivation progress on basis of preselected parameters. Determine set points and configure various controllers individually. Define the inoculation volume and biomass concentration to inoculate your virtual bioreactor. Choose between default mode or one of five different training scenarios as your running mode and select a desired time acceleration factor. BIOSTAT® T CHO is a free of charge bioreactor training software for universities and educational institutes. The initial license is valid for 365 days and can be renewed free of charge by requesting a new license key. For access to the BIOSTAT® T CHO, please request a download link via the contact form below.